When my husband and I were going through infertility treatments, I ended up donating almost all of my maternity clothing from when I was pregnant with our daughter. There were a few reasons I did this. First of all, the clothing was 5 years old and just not in style. Second, I didn't really like much of the clothing when I had initially worn it. I had purchased it to meet a need and primarily looked through clearance racks buying what was on sale, not what I actually liked. Third, it had never fit that well anyway. And finally, with all we had been through, I wanted a fresh start with my maternity wardrobe. I want to celebrate this miracle in every way possible and that means feeling good about the way I look throughout my pregnancy. So here I am starting from scratch. And I am on a budget, too. Where do I even begin to curate a maternity wardrobe I love and feel good in? 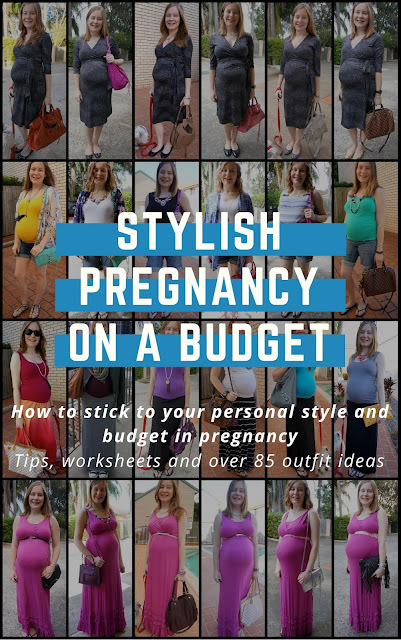 Given my situation, I was thrilled when Mica from Away From the Blue asked me to review her new ebook Stylish Pregnancy on a Budget! She's been through two pregnancies and definitely stayed stylish through each one. Mica is also a master at accessorizing and mixing and matching her clothing so each outfit seems new and unique. What perfect timing to get some tips so I could begin my maternity shopping! For under $3, Mica's book is a quick read jam packed with inspiration and helpful tips on curating your maternity wardrobe. Her tips could really be applied to any closet overhaul, especially if you are on a budget. I really appreciated how she breaks down each step and includes worksheets to help you each step of the way. I would recommend this to any pregnant fashionista or anyone thinking of becoming pregnant. It creates a roadmap for your wardrobe including what you need and what you really don't throughout the 9 months. If you are interested in purchasing you can get it through my affiliate link here. I was provided with this book for free, but all opinions are my own! Ahh the bump! I love it! And you are most def stylish, always. COngrats on Mica for her e-book. Love this dress! Dying over the tan accessories too. These are wonderful tips for dressing during pregnancy. Love this cute and comfy outfit! Creating a stylish maternity wardrobe is definitely more challenging than just everyday wardrobe issues and I have no doubt you'll look great throughout yours. I think I remember seeing this kind of dress on Amy of Straight A Style when she was pregnant. And thinking how perfect, because it would work even after!! I can see why you'd want to celebrate each day of the new baby by looking fabulous. This is such a pretty dress which will grow with you and also fit afterwards. Aww look at your cute bump! You're looking fantastic--what a pretty dress! I wish I would have had Mica's book when I was pregnant. I feel like it's a challenge to stick to a budget when shopping for maternity clothes--why do stores always charge so much?! You are SO cute pregnant! Love this dress and the color on you! YES, I agree! If I ever were to get pregnant again, I would def. want all new clothes. My style has def. evolved over the years and I'd prob. cringe over what I wore (not that I have my pg clothes anymore!). I'm looking forward to seeing your fashion style as a preggo Laura! :) You're going to be adorable! I think you may just be the cutest pregnant lady ever! No doubt you'll be super stylish all the way! You are looking very good and that is a perfect dress! You look great Mama! And congrats to Mica on her e-book! 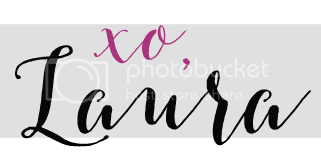 I'm so looking forward to your budget wrap up posts where you'll be sharing all those cute maternity clothes you've been buying - you've been looking forward to it for so long, I know you'll be comfortable and stylish the whole way through. Thank you again so much for sharing my book! :) I really appreciate it. I love that dress!!! Socute how your styled the bump. I didn't like my maternity wear either when I was pregnant with my little . if we ever had another I would spend the time and buy things I would want to wear. 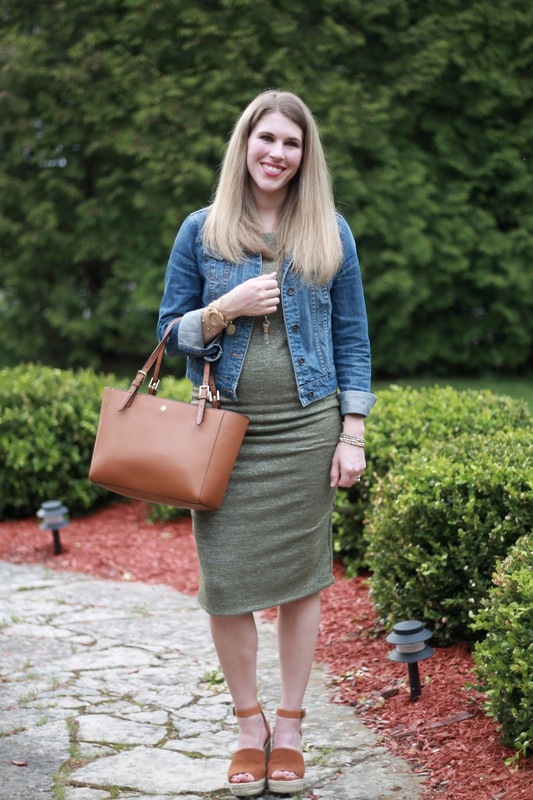 These are great styling tips, lady- and you are looking too cute with that bump! What a cute bump! Love this dress on you! I love your pregnancy style Laura. That bump is so cute!! Congrats! So going to have to check this book out. Since I'm finding it hard to get dress at 5 month of being pregnant.